Heart disease is the #1 killer of Americans, that’s why Bill George’s Olathe Subaru and KC102.1 has teamed up with the American Heart Association to be a relentless force for a world of longer, healthier lives. 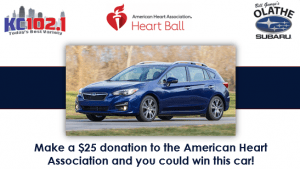 Donate $25 to the American Heart Association and be entered to win a 2019 Subaru Impreza! Heart disease is 80% preventable. Heart disease doesn’t discriminate- it affects all ages, races and genders.